The term ‘cleaner shrimp’ is applied to any free swimming crustacean that cleans other living organisms of parasites. There are a few species of shrimp that this term applies to and they form a fascinating relationship with the fish that occupy the same territories as themselves, they literally clean any parasites off the fish and the fish will even queue up for this privilege in their natural habitat. This form of relationship is classed as a ‘symbiotic relationship’, the shrimps benefit by feeding on the parasites whilst the fish that have been cleaned are free from irritations until the next cleaning session. Other symbiotic relationships are the way that clown fish will feed anemones in order to shelter in the tentacles without being harmed so that they are protected from predators. Cleaner shrimp generally originate from three specific families, Palaemonidae, Hippolytidae and Stenopodidae. 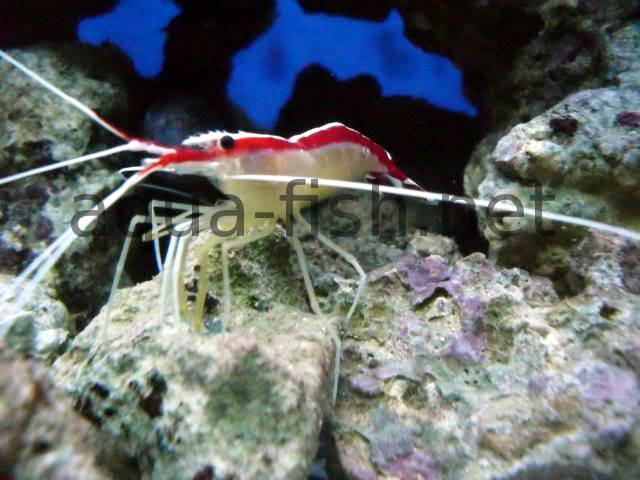 The most common cleaner shrimp to be kept in aquariums is the northern cleaner shrimp (Lysmata amboinensis), this is sometimes referred to as the Skunk cleaner shrimp or the Scarlet cleaner shrimp. These shrimps are found naturally on the reefs of the Red Sea and the Indo-Pacific where they spend their lives scavenging for detritus, dead tissue and parasites from the native fish. They are quite sociable and will gather in groups at ‘cleaning stations’ on the reefs where the fish will queue quite orderly waiting for their turn to be cleaned. These shrimps will even climb inside the mouths of the fish that they are cleaning and will often emerge out from the gill plates leaving no parasites untouched. 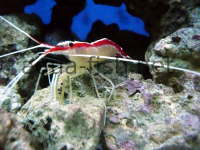 These shrimp are found naturally on reefs so they will need to be added to salt water aquariums to be kept successfully. They are very sensitive to changes in water parameters so must be acclimatised slowly to the new tank water, normally this will take up to 1 hour, they are prone to pH shock if added too quickly to the tank. Besides this they do not really have many other requirements, they will spend a lot of time climbing over the tank rock work waving their tentacles looking for debris in the water and signalling to the fish that they are willing to clean them. These shrimps are marked with two red stripes that run the whole length of the body but this does not ward predatory fish away so never keep these with fish that will see them as food. Be very careful when adding any required medication to the tank, always check the label on the bottle as they are intolerant of any medications that contain copper, this will result in an untimely death if they come into contact with it. When they are first added to the tank you will probably see what looks like a dead shrimp floating around the tank, this happened to me the first time I kept these. What you are actually looking at is a moult from the shrimp as it sheds its skin on a regular basis and this will normally occur straight after it has settled into the tank. It may take these shrimps a few days to settle down once they are first placed into the tank and they will hide away during this time but eventually they will explore and very quickly they recognise the keeper and associate that person with food. They will become very tame and will even take food from your fingers and even attempt to clean your fingers which is a very strange feeling indeed. They are a very peaceful species and more than one specimen can be kept in the same tank, I have kept 2-3 of these in a reef tank with no problems but in my opinion each shrimp will require at least 10 gallons of tank space to allow them to create their own territories. Until recent years it was believed that this species of shrimp was gonochoristic, this means that basically there are male and female specimens. This has now been proven to be false and they are in fact hermaphroditic, every specimen is capable of producing sperm and also to produce eggs. What this means to the potential breeder is that any two shrimp added to the tank are capable of producing offspring. They are also capable of storing sperm which will allow them to continue laying fertilised eggs even when the pair has been separated. The eggs are green in colour and are held in the body shell until they are ready to be laid, at this stage the eggs are transferred to their legs. With experience it will become obvious when the eggs are ready to hatch as they will lose their green colouration and turn to a light brown colour. Hatching will only occur after the tank lights are out, normally after an hour of darkness and the mother will release the shrimp larva into the water column. 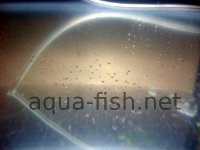 There can be up to 1200 eggs in each batch so the number of larva released into the tank is very significant. Once the larva are released they are capable of hunting for food, the best way to get them eating is to supply them with newly hatched brine shrimp that have had a feed so that they contain more nutrients. Be prepared for a high mortality rate with the larva, they are very delicate when first hatched. After 5 days they will develop into their secondary stage and their body shape will change. Eye stalks will appear and their will be some of the red colouration in their bodies. After 11 days they will enter their next stage of development and they will now resemble miniature shrimp,clawed legs will be formed and by the 13th day they should be fully developed. The cleaner shrimp is not easy to breed and there may be several failed attempts, it is worthwhile to keep attempting to raise young and once successfully achieved it gives you a great sense of pride! "Cleaner Shrimp." saltwater.aqua-fish.net. Wed Mar 3 13:16:40 UTC 2010. Aqua-Fish.Net. 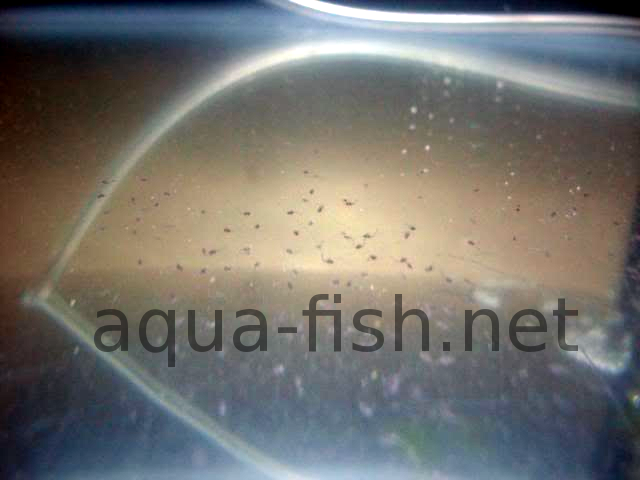 Tue Apr 23 21:55:45 UTC 2019 https://saltwater.aqua-fish.net/?cleaner-shrimp.